There’s nothing I love better than being surprised by a movie. I’ve seen so many for so many years that I admit I’ve gotten pretty cocky about being able to tell how most movies are going to go about thirty minutes in. 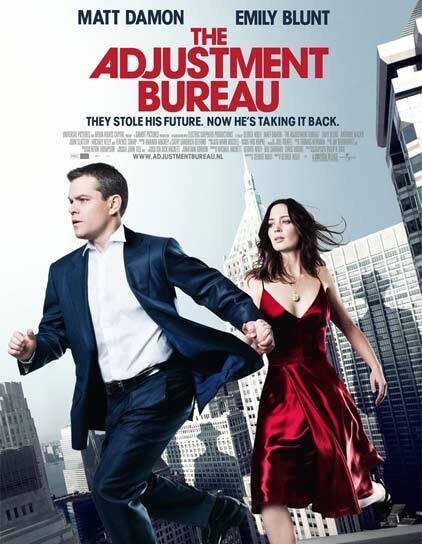 I’m happy to say that didn’t happen with THE ADJUSTMENT BUREAU. How could I have guessed that a paranoid conspiracy thriller was just a disguise for a love story about the nature of free will? David Norris (Matt Damon) is a politician from Brooklyn, NY running for the United States Senate. He’s embraced by the public who love his youth, his energy and his boyish optimism. None of that helps when an embarrassing incident from his past catches up with him and he loses the election. It’s when he’s at this darkest moment that he meets Elise Sellas (Emily Blunt) who’s hiding in a stall in the men’s room. They hit it off to such an amazing degree that David is inspired to go out and give a concession speech that’s better than most victory speeches. David goes to work for his campaign manager with an eye to make another Senate run a few years down the road and believe it or not, one day while riding the bus to work he sits right down next to Elise. This despite the best efforts of a group of men who dress like Madison Avenue advertising executives led by Richardson (John Slattery). They carry small black books whose pages are filled with complicated designs that shift and move on their own. They have the ability to teleport great distances simply by walking through certain doorways. They can influence and cause seemingly random events to occur. They can read minds. They make cryptic references to ‘The Plan’ and they seem extremely interested in keeping David away from Elise. Indeed, they go so far as to explain to David who and what they are. THE ADJUSTMENT BUREAU really blindsided me in a good way. I expected automatic weapons and car chases halfway through the movie. Instead what I got was a really intelligent discussion between David and Thompson on the nature of free will and does mankind truly possess it or not. Due to the acting power of Matt Damon and Terence Stamp it’s a discussion just as thrilling as any car chase. Not that we don’t get a great chase where David learns how to use the doors himself and with Elise is pursued all over New York, trying to stay one step ahead of Thompson and The Adjustment Bureau. It’s just that the whole point of the movie isn’t chases or explosions. It’s about a man willing to defy forces greater than himself for True Love. I don’t think I’ll ever be able to watch “Mad Men” with a straight face after this movie since John Slattery looks as if he came right from the set of that TV show to do this movie. He’s quietly amusing, playing Richardson as an overworked bureaucrat who just wants the paperwork to be straight. Anthony Mackie has a pivotal role in the movie that he’s more than able to handle and it’s from his character that we get a lot of the information about The Adjustment Bureau and how it works. But the movie wouldn’t work without the chemistry between Matt Damon and Emily Blunt. Yeah, their Meet Cute is an eye-roller but given what is learned later on, it makes sense. If the chemistry between them doesn’t work, it’s not going to sell the story. Fortunately, it did for me. Their courtship is sweet and simple. It’s the outside forces trying to keep them apart that complicate things. Matt Damon really is a wonderful actor. He can do comedy and drama and he never appears to be working hard at either. Emily Blunt I’ve enjoyed more in movies like “Sunshine Cleaning” “Boudica” and “Charlie Wilson’s War” but that’s not to say she isn’t good here. 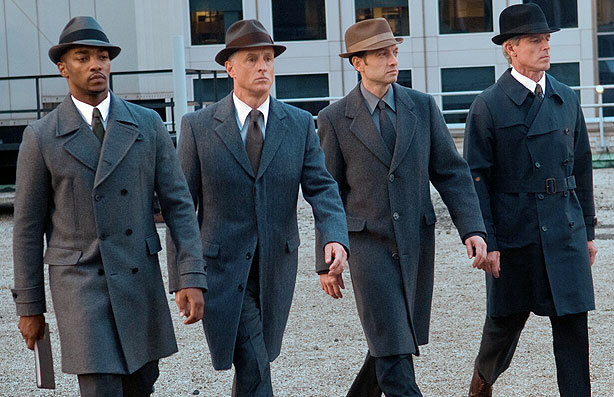 So should you see THE ADJUSTMENT BUREAU? Absolutely. It’s a remarkably smart movie with good, solid performances and a mind-bending premise solidly rooted in a love story where the protagonists truly deserve to be in love because of what they do, not just because the girl can crinkle her nose just so cutesy-poo or because the guy’s a hunk. Highly recommended. Great review by Derrick Ferguson! NextNick Fury, Agent of S.H.I.E.L.D.